Talk about some legendary cars and the first name that comes to your mind is Maruti 800. It has the right to be called a legend since it is in production for close to 3 decades and is still sold in a number of small cities where BS IV norms are not prevailing. The BS III variant is still going great but as per the latest news, this iconic car is soon to get replaced by a new small car which is being developed by Maruti Suzuki. There have been discussions, news and rumors on the Maruti 800 CC Replacement car in India in the past as well. Here is a Spy Pictures of Small Maruti Car spotted last year. Also there has been talks of small car YE3 in India by Maruti Suzuki which will be placed below the 800 CC Maruti Alto. As being reported by HinduBusinessLine, Maruti is developing an all-new replacement model for the enormously successful 800 and in all probability will bring the same to the market by the end of 2012. 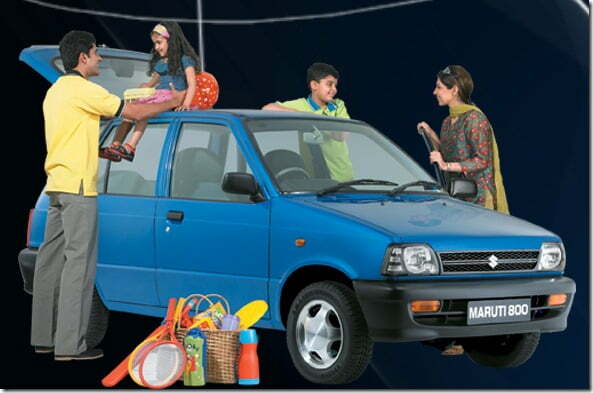 Although the replacement is going to be an all-new car, Maruti is expected to adopt Maruti Alto K10’s platform. This will help Maruti save some money as no new platform shall be developed for this new car. Coming to the engine, we have seen the 800 CC F8D engine in many version, ever since it was introduced with the Maruti 800, and this time around it is speculated that the same engine will be tweaked and re-tuned so as to become compatible with the new car. The engine already comes with fuel injection technology which makes it fuel efficient but considering the demand and other models in the market, Maruti might have to go an extra mile. The interesting part, which is still unseen, is where Maruti will position the car. The new car will either be positioned above or below the Alto which would be interesting to see as the pricing and features will solely depend on its positioning. This is in competition with the upcoming cars from Datsun brand and Maruti will try every bit to keep its customers to itself and not let them migrate to some other brand. Maruti Suzuki MEO, I V Rao confirmed that Maruti Suzuki will stop the production of the ongoing Maruti 800 in April 2012. This means that Maruti 800 will be completely phased out before it is replaced with a new entrant, another small car from Maruti Suzuki which will replace the iconic Maruti 800 in a segment below Maruti Alto. The car is under development and is already being tested by Maruti Suzuki India. The launch of the Maruti 800 2012 replacement is expected to happen by the end of the year 2012. If all goes well on the testing front, we expect that Maruti will try to bring it before Diwali 2012 which falls in November to take advantage of the festival season for getting a good head-start for the new model. The new small car will feature a modern BS4 engine, most likely the tried and tested FD8 engine which powers the Maruti Alto successfully and will deliver a fuel mileage of 20+ KMPL per lite of petrol as high fuel economy and low maintenance has been the USP of Maruti 800 and Maruti Alto small cars. It will be interesting to see how the replacement of the Maruti 800 will do in the rapidly evolving Indian automobile market.